Vaughan Company With over 50 years of solids handling experience, introduces the TRITON Screw Centrifugal Pumps. Combining the benefits of Vaughan’s superior pump designs with the advantages of high efficiency in a non-clog design. 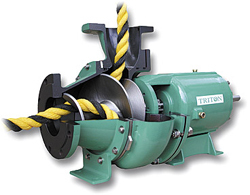 The TRITON Screw Centrifugal impeller is ideal for handling thick sludges, large or stringy solids, shear sensitive fluids and delicate or highly abrasive materials. Unique features include steep performance curves, non-overloading power characteristics, heavy-duty power frames, flushless mechanical seal design to eliminate water flush requirements, or an optional standard power frame with water flushed mechanical seal or packing. All Triton Screw Centrifugal pumps in Horizontal or Vertical Pedestal configurations are available with the Vaughan flushless mechanical seal.